Huge changes are happening on a daily basis in Puebla, Mexico. The concept of Estadio Cuauhtémoc’s redevelopment includes adding upper tiers behind both goals, though without filling in the corners. This will make the building still very distinctive among Mexican and in fact world stadiums. Together with seat replacement and renovations of existing stands, capacity will increase by 8,000-10,000 seats. While corners are left open, the entire stadium will be wrapped by a high outer wall, creating the illusion of entirely enclosed stadium. The wall itself is a very light steel structure covered with translucent foil in shades of blue and white. By day the translucent foil will feel very light, while at night it will allow interesting illumination. 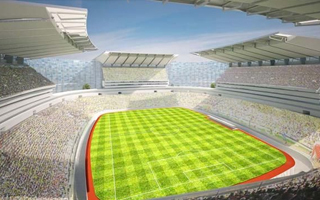 The outer wrap led to many comparisons in Mexican media, primarily to Allianz Arena. Having foil around the stadium is hardly enough to match the brilliant German stadium, but when you look at the price of the works in Puebla , the final outcome should still represent decent value for money. Initial budget of the redevelopment was expected to stay within MXN 566 million, but by April 2015 it grew to 730 million ($46m / €42m). The price includes renovation of the current structures, particularly the roof.